Renault taxis for sale from Cab Direct! 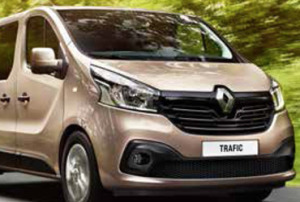 We're offering the Renault TRAFIC Shuttle to our customer base in both SWB and LWB versions. The TRAFIC has a flexible interior and can seat up to nine people in comfort. Customers can choose between the Business specification or the generously equipped Sport NAV. The TRAFIC has plenty of space but also has a car-like driving experience. Three efficient common rail diesel powertrain options are available, giving you a great combination of performance and economy. The scale and presence of Cab Direct gives us excellent buying power with the manufacturers and we are able to pass these savings onto licensed taxi drivers and operators. What’s more, Cab Direct has access to a panel of lenders which offer the most competitive finance deals in the industry. Get in touch today for a quote and you could grab a new cab for less than you might think possible!